Down on the farm: Amster Amster Dam Dam Dam! Okay, so here are the rules: 1) I will post as many pictures as I think tell the story. 2) If you get bored you may leave. 3) Once again, I write this blog mainly for selfish reasons. It's oftentimes my only chronicle! In this case, I'm thinking I'll publish some sort of book on our trip on one of those fancy dancy scrapbook sites. But I WILL fill my blog with Europe for a few days. Be warned!! One of Amsterdam's myriad of canals. We rode on the canal boats with reckless abandon for most of a day, hopping off and on when something caught our eye. Picturesque to the extreme!!! The Rijks Museum. We drank this place in. Actually we went twice. The first day they had some sort of evacuation which we never really got to the bottom of. Thousand of people pouring out quite nonchalantly, and they never let anybody back in. Backed up plumbing? Out of Rembrandt postcards? We'll never know. Sheep. I think I was supposed to be buying wooden shoes and absurdly-priced Dutch cookies in a gift shop. I found this instead. And this and this. Paco was hitting on this Dutch gal, so I turned her to stone. I figured establishing myself as alpha wife early in the trip made solid sense. We didn't have any more trouble. I grew up eating ebilskivers many a Sunday evening, so these didn't even tempt me. Do NOT ask me how Welsh, Scottish, and English parents translate into ebilskivers because I have no answer. We also walked by the waffles on the street because I was saving myself for Belgium. I'm virtuous that way. A green and black house. And they get away with it!!! We looked around for Don Quixote, but he was sorely absent. Why did this conjure up memories of an old Hailey Mills Disney movie, "The Moon-Spinners"? 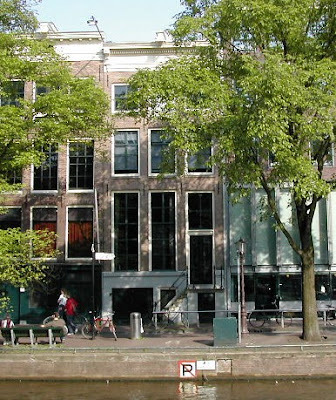 Anne Frank's house. So so cool. Much bigger than I had pictured. There! Now that wasn't so bad was it? Go get some rest. Tomorrow is a new day. We can do this!!!!!! I love all your pictures! Keep them coming!! That was the biggest ableskiver pan I have ever seen! I was a little surprised they were making them on the street in the Netherlands. I thought they were pure Scandinavian. I just read that Amsterdam is the bike capital of the world. Your picture is proof. Hope the waffles in Belgium were worth the wait. I'm loving this! I love, absolutely love, all the pictures and commentaries, especially of the Netherlands! I agree that the wooden shoes are perfect. Thanks for sharing. Those tiny tiny wooden shoes!! !